This book, originally published in 1903, is the best thing I've found on Greek mythology or Greek attitudes to things of the spirit generally. I forget exactly what prompted me to get it, probably favorable mention of it in some other book, but in July 2010 I got myself a used copy of the stout Meridian Books paperback published in 1955. An imposing tome of 682 pages, it sat on my shelves until just 5 months ago. At that time I had hit, as I occasionally do, a gap in my reading, and I came down to the "library" (a carpeted storeroom housing our freezer and 3 Ikea Billy bookcases) to prowl for something of interest. I finally decided to give the Prolegomena a chance. I was immediately impressed with the author's perceptiveness, authority, and approach. The book's 12 chapters take one on a journey from "chthonic rituals" of "ghosts and sprites" to an extended discussion of Orphism, which occupies the last 4 chapters. And what a journey it is: I felt that all kinds of puzzles and mysteries and seeming inconsistencies of Greek mythology resolved and fell into place. The fascinating thing about this book is that it has very little to do with what I had always thought of as Greek religion, which was a religion centered on the familiar gods of Olympus. Jane Harrison occasionally mentions these gods in passing, but her interest is in all the religious phenomena that lay in the penumbra of the spotlight pointed on Olympus by Homer and other classical authors. Her interest is in tracing the development of Greek religion from its most primitive manifestations up to its most sophisticated ones. The Olympian gods formed part of that story, but only a part, and seemingly, as this author tells it, by no means the largest part. I was already aware that ancient Greek religion had been formed by a collision between the prehistoric matriarchal system of the ancient inhabitants of the Balkan Peninsula and Crete and the patriarchal invaders who swept down from the north and east. 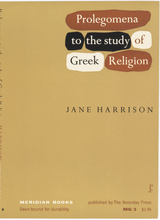 But Harrison shows how the deepest layers of Greek religion need to be sought in the beliefs and behaviors of primitive people who fear, above all, ghosts. Much of what develops into what we call religion begins with the riddance and placation of the souls of the dead, who, when angry, vengeful, or envious, can bring terrible misfortune to those still living. Long before there is anything so definite and well characterized as a personal god, there are countless invisible sprites--the Keres of ancient Greece--who affect the human world for good and ill, and many of Greece's famous festivals and rituals had their origins in repelling, expelling, and appeasing these ghostly figures. Harrison shows how goddesses and gods eventually emerged from these primitive spirits, and how these gods eventually became clearly distinguished and named--even if with a number of different names. And she shows how these two eventually gave way to a higher, more mystical kind of religious experience and practice that gained the name Orphism. Some investigators have believed that Orpheus was a god, but Harrison dismisses this view. To her it's clear that Orpheus was a man, a revealer and reformer who created a mystical new religion inspired by the worship of Dionysos and injecting new esoteric meaning into primitive rites. Much of the author's argument is based on the interpretation of ancient Greek art: vases, bowls, funerary monuments. The book is richly illustrated with black-and-white reproductions of these, and Harrison's depth of knowledge of these artifacts is most impressive. She knows what she's talking about. The prose itself is very readable. Harrison writes with passion and admiration, even as she does not hesitate to criticize and pass judgment on ancient practices and authors when they reveal signs of savagery or confusion. She is quick and punctilious to acknowledge the work of other scholars, but unafraid of noting when she disagrees with them or rejects their ideas. She is also well versed in the ancient authors and treats them in much the same way; she relies on them, but is aware of their personal shortcomings. There are a couple of interesting footnotes too in which she admits that some theory of her own, already appearing earlier in the book, is in error! Read carefully. In all, a thoroughly excellent book. If you're new to ancient Greek mythology and religion, then you probably should not start here. Acquaint yourself with the Greek myths and festivals, and then reach for this book. You start to see how all those various strange myths start to make sense; they are expressions of a few guiding principles that underlie their formation. For us in the West, Greek mythology is the mythology; when we talk about "myths," often we mean Greek myths. Our culture is shot through with them; our modern stories are based on them and are filled with allusions to their events. For example, I'm currently reading The Golden Compass by Philip Pullman, published in 1995, and I suddenly realized that some of the action was based on the Oedipus myth. But those myths are the tip of an iceberg, and to appreciate them fully one should have a sense of the shape and depth of the berg that lies below the waterline. Jane Harrison's book examines the underwater part of that iceberg, and it's illuminating indeed. Sign into Goodreads to see if any of your friends have read Prolegomena to the Study of Greek Religion.